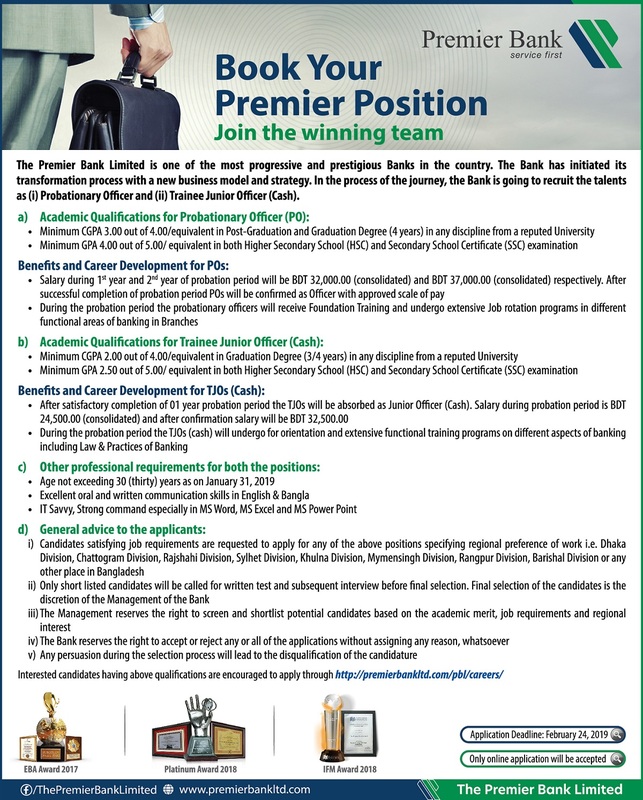 The Premier Bank Limited published New job vacancy Notice at www.premierbankltd.com . Premier Bank job circular offer some New vacancy in this post. MBA, Masters, Health Economics, Computer Science pass student can apply this Premier Bank job circular 2019. You have to complete your Premier Bank online application before 24 Feb 2019. Positions: Trainee Junior Officer (Cash) & Probationary Officer. For more information see below this original circular If you are able to apply this Job Vacancy Notice please apply using below this link. Candidate can easily apply dgt online application from visiting http://premierbankltd.com/old_pbl/career_new/index.php . For Apply You have to collect your Pass port size image with signature. DGT SMS format also available at ejobscircular.com . This entry was posted in Bank Career and tagged bank jobs, http://premierbankltd.com/old_pbl/career_new/index.php, Online job applications forms, Premier Bank Job, The Premier Bank Limited Job Circular 2019 by ejobscircular. Bookmark the permalink.